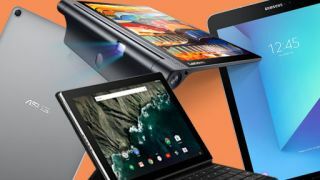 Best Android tablets of 2019: which should you buy? Getting the best Android tablet can be tricky, as the best pick for you could be the highest spec device or just an affordable, bigger-screen sidekick to your smartphone. Fortunately, there are plenty of top-rated tablets to fit your needs. We’ve kept track of all the latest and greatest Android tablets, whether they be high-performance tablets from Samsung or budget champs from Amazon. Our recommendations are based on a combination of features, build and design quality, specs and performance per dollar, and overall value. As more tablets come out, we’ll keep this list updated, including as these tablets (and new picks) update from Android Oreo to Android Pie. Samsung knows what it takes to make a good Android tablet, and it has upped the Galaxy Tab S3 with the newer model. It still boasts an HDR-ready Super AMOLED display, but its gotten a sharper display. Inside, the new tablet is powered by a Snapdragon 835 chipset with 4GB of RAM for superior performance, and it runs Android Oreo out of the box. If you want a great tablet for multimedia, the AKG-tuned quad speakers will help. And, for productivity, the keyboard support, S Pen, desktop-like Dex interface should prove handy. The Samsung Galaxy Tab S3 still has a lot to like, especially thanks to its HDR-ready display, four powerful speakers and the S Pen that's included inside the box. The keyboard folio is a worthwhile extra. If you’re into watching TV shows and movies on a tablet, its HDR screen will look great, especially for HDR content from Netflix and Amazon. While the Snapdragon 820 inside isn’t as strong as newer chipsets, it should be up to light productivity, especially since it’s paired with 4GB of RAM and a sizable battery. The Asus ZenPad 3S 10 might look like an iPad in design, but given its roots in Android, it's obviously a much different beast. For your money, it's a hard ask to find another Android tablet that puts classy design at the forefront like the ZenPad 3S 10. Paired with its gorgeous 2K display and strong audio performance, it makes quite the impression from a multimedia perspective. Google's first foray into crafting its very own tablets couldn't have gone much better. While it was once the best Android tablet out there, the Pixel C is still recommended for a few reasons. Its design borrows from the gorgeous Chromebook Pixel, then builds upon it with versatility to allow easy switching between a standalone tablet or a laptop. Android power-users will also appreciate that it runs stock OS. The Pixel C certainly isn't cheap, but the best things in mobile computing rarely are. Even if this pick starts to seem dated, its sharp 2,560 x 1,800 resolution display should continue to look great for media playback. Samsung fired straight at the iPad's greatest weakness when it launched the Galaxy Tab S2: storage capacity. The older model from the popular smartphone and tablet maker offers 32GB of internal storage as the standard out of the box, with support for up to 128GB via the microSD slot. It also stands out amongst the greater tablet competition with a stellar 2,048 x 1,536 Super AMOLED display and Samsung's own zippy Exynos 7 5433 octa-core chipset, which consists of a 1.9GHz quad-core processor working in tandem with a 1.3GHz quad-core processor. Though the Tab S3 and S4 have since surpassed this tablet, the S2 still comes recommended given that it now easy to find a great Tab S2 deal. You can find a cheaper tablet further down on the list, but you'll be giving up on the compact, premium design of the MediaPad M3. The Amazon Fire HD 8 (2018) replaces last year’s model while changing very little. Fortunately, that means its strongest point has remained intact: price. Amazon’s tablets offer incredible value. In this case, you get a portable tablet for well under $100, and it packs a quad-core processor, 16GB or 32GB of storage, and an 8-inch display with a 1,280 x 800 resolution. The cameras and speakers are nothing special, but you can plug into the 3.5mm headphone jack and enjoy media that way. This is primarily a good pick for people who want an affordable media device. The Fire HD 10 (2018) has shifted its focus from the previous generation. It may have gotten slightly heavier and thicker, and its cameras may be a lower resolution, but it’s still a better tablet in a few key ways. The new model offers 32GB or 64GB of internal storage with microSD expandability for flexibility beyond that. Its battery life is also slightly improved while also doubling system memory and increasing the CPU clock speed. The star of the show is the new display, which comes at a much improved 1,920 x 1,200. You’ll be able to enjoy your movies and TV shows in Full HD now.